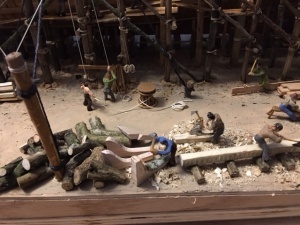 This model of the Constitution was started in about 2003 in 1:64 scale. Which would make a huge model if fully rigged in all her glory. 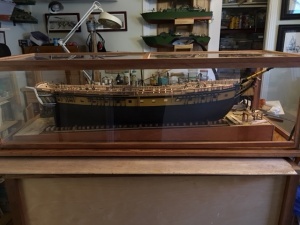 I chose that scale because I had made several other models in the same scale, (Raleigh, Essex, Vandalia) and I was interested to show just how much larger and more robust the American “heavy frigates” were than lighter ships of the era. 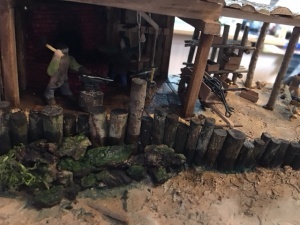 This difference in ruggedness of construction and heaviness of armament is nicely presented in the movie “Master and Commander” for those interested. The “make and space” from the Doughty draft had framed 22″ wide and interval spaces of 2″. I made up the frames of maple, gluing up the futtocks to approximate shape, then band sawing them to near final contour on the inside, and a bit more on the outside. Once all the straight frames were rough cut, I made a plywood blank for each end, about the shape of the frame, and used a 3/8″ threaded rod to bolt the frames together, aligning the tops of the frames. This let me use power sanders to do the final shaping of the frames. 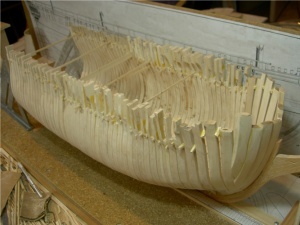 The keel, stem, stern, etc. were made up of red oak. I made a building board with a base for the set up of frames, and a back side with the Doughty draft on it. This latter feature was quite helpful in keeping the framing and later planking correct. 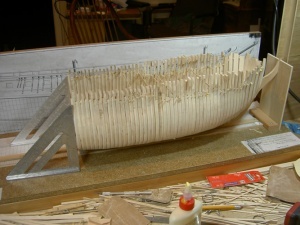 Here is a picture of the keel, stem and stern on the board and the frames being set up on the keel. 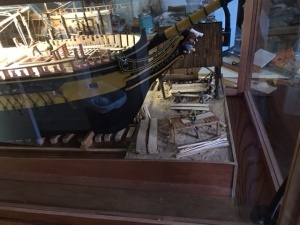 Once the straight frames were set up the forward cant frames and stern timbers were shaped and fitted, including transoms, etc. 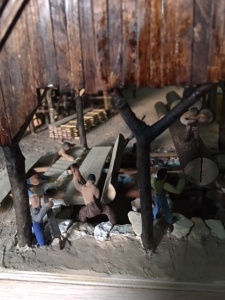 Cant timbers. 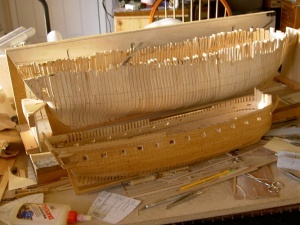 Note the 1/32″ spacers used to keep frame alignment while working on the hull before the first planks are added. 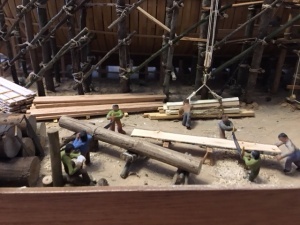 Once the timbering was complete, I first planked the wales on both sides. 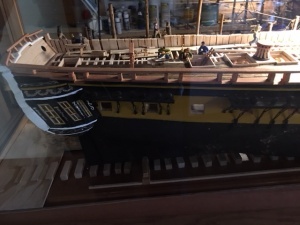 The impressive scale thickness of the wales, plus the thickness of the frames made the origin of her name “Old Ironsides” apparent. 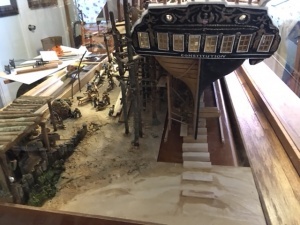 Here is a picture of the Constitution hull in process with the hull of the Raleigh, also under construction, to show the difference in size of the hulls of these two “frigates”. 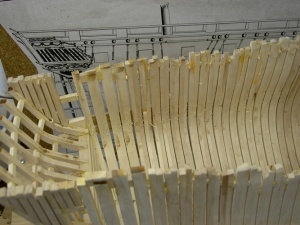 The model had been partially completed with planking above the wales by about 2004. Then it was stored away for maybe 8 years until I decided to complete it as a hull only model, without masts and rigging. 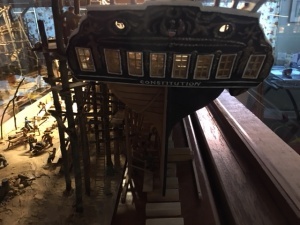 Also, wanted to build it using the Doughty plan from 1794 and some conjectural reconstruction of what she might have looked like at launch in 1794, not as she appeared during the war of 1812, when she gained her fame. 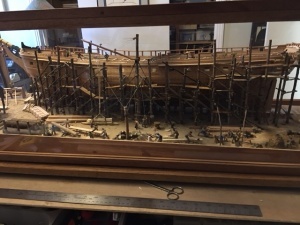 So once the Vesuvius was completed, I got the Constitution onto the bench and re-re-re-started this project. 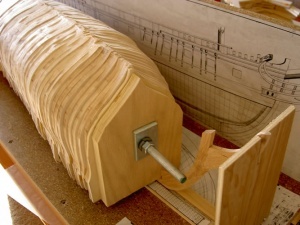 Initially, I planned to plank one side of the hull and deck so details of interior framing could be visible. But, with the close spacing of the frames, I realized that not much could be seen, so I abandoned this plan. Then, there was another change of plan. I decided to model the ship on the ways at launch. 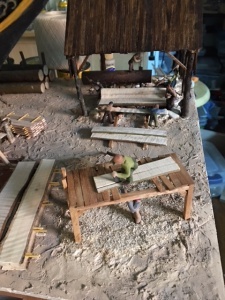 I planned to finish of one side with paint and some of the furniture and equipment that might be aboard at launch, but leave the other side unfinished and under construction as it might appear at a ship yard of the time. 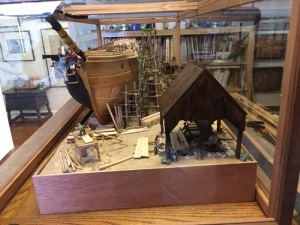 This concept, naturally, got out of hand pretty quickly, and the model ended up as planned for the nearly finished side, but the shipyard side became a diorama, with about 50+ figures showing the processes involved in building such a ship. 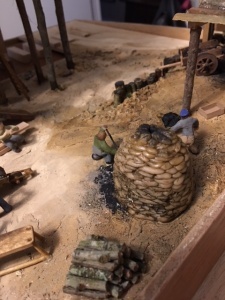 From pit-sawing, to blacksmithing, through carving, and painting. 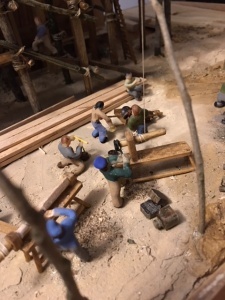 See the Constitution Blog for more detail on the construction of the diorama and the specifics of some of the decisions made in modeling.